[AAA] Almost and a surprise. | there's no place like gnome. [AAA] Almost and a surprise. I just checked into a hotel in Beaver Creek in the Yukon Territory. Beaver Creek is a few miles short of the Alaska border which means only six and a half hours of driving tomorrow. I felt up to putting in a few extra hours on the road tonight [I’ll explain below.] before I checked into a hotel. Before I checked into my closet. Seriously. It’s the tiniest room you could ever fit two twin beds into – smaller than a dorm room. There is a bathroom for tiny people – everything seems to be in miniature. The hotel, in general, makes me feel far more comfortable than the sketchy dive I stayed in last night despite that it was built for leprechauns. Much more comfortable. I set off extra early this morning [wanting to leave the sketchiness behind me] and did more mountain driving. It was rainy and cloudy and lent more fog to the mountains and lakes as I drove on. In my current tired state and the 55 hours of driving behind me, the rest of the day is running together. I can’t remember if I drove through any cute towns or saw anything out of the ordinary. [If I can’t remember, I’m guess not. Still no moose!] I do recall pulling into a rest area and refusing to go to the bathroom in the pit toilets that make the outhouse at our cabin seem like a throne. It was mostly overcast through the morning and early afternoon, leading me to yawn and grow sick of driving. This was the first time in the last week that I’ve really felt tired of driving. In the days prior, the scenery was new and different and kept my attention. Today, the scenery seemed old hat. I’ll give this the fictional diagnosis of safari syndrome. I remember while on safari in Tanzania a few years ago we grew so excited at the sight of new animals from our land rover. But then, even though we were a part of this incredible experience in Africa, elephants almost grew to be … eh. No big deal. Elephants were everywhere. It was the new animals – the lions, the cheetahs, and the ostriches that we then got excited about. Elephants? Eh. Been there, done that. 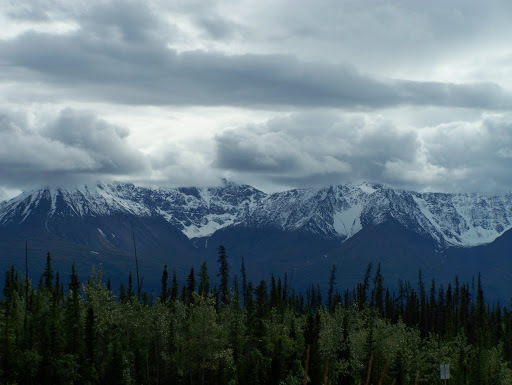 It seemed I suddenly turned a corner and there were these huge, snow-capped mountains looming in front of me. I found energy, excitement, and wanted to drive closer to find a better angle for a picture. I found my new animal. 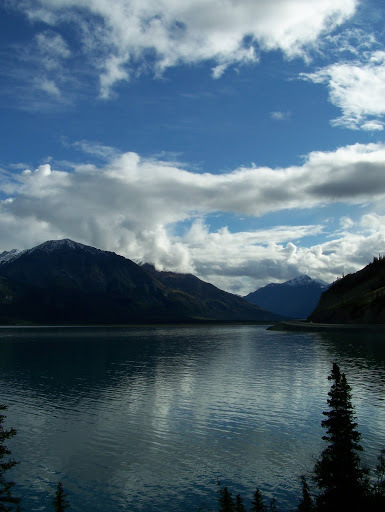 I was going to stop in Haines Junction for the night, which rests at the feet of these mountains [the icerange – the highest mountains in canada] but found no vacancies. Driving along the mountains gave me the extra energy to travel another three hours [making it a 14.5 hour drive today] to Beaver Creek. But then there weren’t only these mountains but then this lake which the road wound around. Too much beauty. Too many perfect pictures I couldn’t take for lack of a road shoulder. Too much. There will be more photos, stories, and other surprises to come, my blog friends. But now I must make myself a pb&j for a very late dinner and settle into my closet. [I’m in the lobby right now to use the internet; once I go to my closet, I’m in the interweb darkness. Time to read, craft, or write – the other projects I brought along with me but haven’t touched.] I may find myself with more time in the next few days to update and educate you to the journeys and thoughts of this gnomepreacher. More time when I arrive at my brother’s and can see my Jetta [the dog] and not drive for half a day. Joy.